Recently Gaya Travel Magazine was privileged to join a special event called TS Day Out 2015 from 31 October until 3 November 2015, which was a familiarisation trip organised by Tourism Selangor. TS that combined destinations in Selangor and Sarawak at one go. The purpose of the trip was to increase awareness on what both states can offer to domestic tourists who seek quick getaways, including TSSB’s ability in offering fun-filled tour packages to both states for the public to choose. The destinations covered by TS Day Out 2015 were Klang in Selangor and Kuching in Sarawak. The familiarisation media trip organised by Tourism Selangor was also joined by other few media fellows from magazines and of course, our uber cool local bloggers. The participants of the TS Day Out 2015 started the day with an exciting race in Klang. I got to pair with a guy from Unit Perancangan Ekonomi Negeri Selangor (UPEN) who seemed quiet at first but amazingly knowledgeable about places and local life in Klang. The race was fun! I must say that initially, we were not sure how to answer the challenging questions, some required photos as proofs, while other needed us to buy items using the money provided by the organisers. We started a bit late as we needed to eat for energy. We developed our strategy over tosai and iced milo, and quickly joined the race afterwards. We managed to get almost all of the photos (with me and partner’s witty poses in them) and we bought melur flower and laddu as proofs. I managed to get my left hand to be painted with paisley patterns as one of the answers as well. As we walked pass the area (mostly at Little India), I figured that Klang has a lot to offer despite its size. I was impressed with the spot where the houses of worship of three different religions are situated in one place; at the back we spotted the temple and when we stood on the middle of the road, there was a church on our left and we saw a mosque on our right. Either planned or coincidence, this spot made me proud of being a Malaysian for its harmony and respect towards different colour or creed. We then proceeded to find the keris (Malaysia’s traditional weapon) and heritage artefacts to continue answering the questions. At 2:00 p.m., we hurried back to the first checkpoint and were rewarded with refreshing coconut drinks while given ample time to transfer all the photos to the organiser’s database. 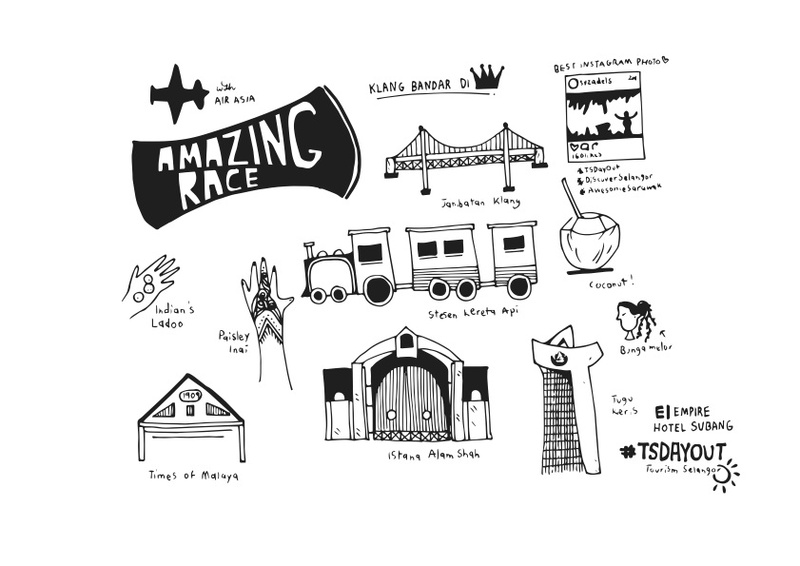 The race was indeed educational because it exposed us to what Klang has to offer. It did function as Selangor’s state capital from 1880 until 1898 before the founding of Kuala Lumpur and Shah Alam, therefore travellers to the place will be able to witness a number of vestiges such as Gedung Raja Abdullah (Raja Abdullah Warehouse built in 1857 that was once used to store tin, food and weapons) and Raja Mahadi Fort (built in 1866 by Raja Mahadi Ibni Almarhum Raja Sulaiman during as a fortress for defence purposes against the incursions of Raja Abdullah Ibni Raja Jaafar). Our favourite would be the Sultan Suleiman Building (also dubbed by the locals as the ‘White House’), which is now turned into the Sultan Abdul Aziz Royal Gallery, which highlights the rich history and heritage of the Selangor Sultanate originating in 1766 from the Bugis Sulawesi Royal family of Opu Tanreburung Daeng Relaka of the Malay Archipelago until present day. Waking up after a four-hour sleep made me feel drowsy but was easily cured by a simple breakfast prepared by the Empire Hotel Subang team, especially the sandwich and banana, which I liked and packed shamelessly for the journey to the airport. Speaking of Empire Hotel Subang, it was a pleasure staying there for a night after the weary race in Klang and the marvellous dinner afterwards – I had two plates of barbequed squid, chicken, lamb plus Halloween-themed delicious desserts. We flew to Kuching on Air Asia – being able to be seated in one of the Hot Seats (the first five rows in front of the cabin that allows passengers to enter and exit planes fast and the two rows next to emergency exit in the middle of the aircraft that offer more legroom) was really a huge bonus! To me, AirAsia never disappoints, though the crafts tend to be delayed at times. This time around, my travelling partner was the travelling beruang (teddy bear), inspired by the initiative propagated by the Malaysian celebrity and actor Ungku Ismail Aziz for cancer patients. As I took the bear during my travels, it is my hope that cancer patients are able to see the world through my eyes! As we took off high in the sky, I managed to take a nap and woke up finding myself hungry. I ordered a set of chicken rice, then slept again. The seat was cosy and the journey was smooth. After an almost two-hour flight, it was ‘Hello Sarawak, mun kamek sampei tok!’ (it means ‘I have arrived!’ in Sarawak Malay dialect). Being able to speak the dialect made me extra thrilled to explore this hornbill state. 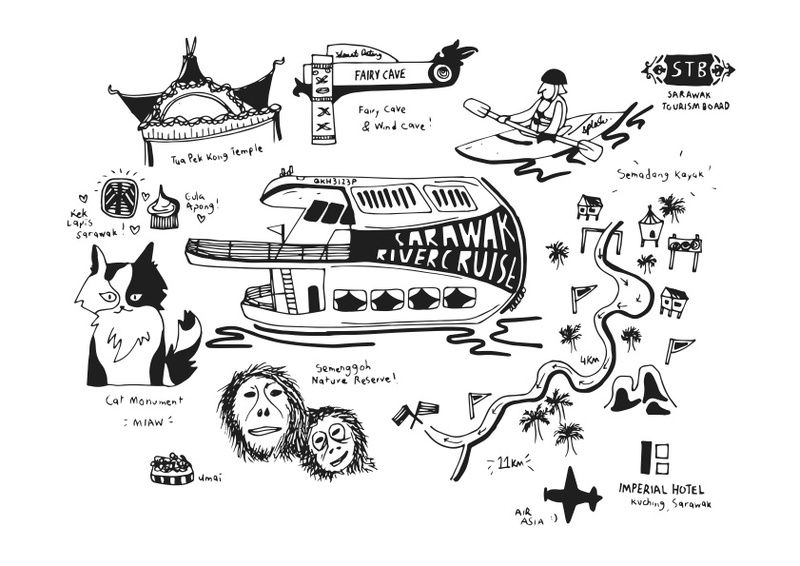 Sarawak is well-known for its majestic tropical nature and outdoor adventures. Its traditional kek lapis (layered cake) and terubuk masin (salted fish) are also the best. The day proceeded with the city tour to must-visit places such as the Cats Monuments, Toa Puk temple, Sarawak state museum, Kuching South City Hall, culminating at the sunset cruise. The day was a little gloomy due to the rain and we didn’t get to see the sunset, but it was cheery nonetheless since we had locals dancing and making merry on the boat. We also saw the huge mansion belonging to the former Chief Minister of Sarawak Taib Mahmood from the river. We were then taken to Top Spot (a food court on top of multi-storey car park that is famous for seafood in Kuching) for dinner. Everything served looked tantalising; we had midin (stir-fried fer), oyster omelette, steamed fish, siput buluh (bamboo snails) and bird nest’s soup. The dinner was a great ending to a fun-filled day. The next morning after breakfast, we proceeded to Semenggoh, known to be the semi-wild place to witness the much touted orang utan in its habitat. During the first 20 minutes, the keeper shouted and called these creatures to come and eat the fruits. Slowly, the orang utans emerged from the dense jungle, climbing and hanging on the trees heading towards their food. It was my first time to be that close to a wild orang utan (which is said to be aggressive when provoked). I am happy to announce that I can cross this valuable experience from my checklist. Right after the visit, we engaged in kayaking. I don’t usually fancy sports that utilise hands a great deal (I prefer to hike) but this session was really awesome. The safety briefing was first given by the Semadang Kayak team, and then we were left to paddle with a partner along an 11-kilometre stretch. As long as there are no crocodiles, I knew I will be fine (and there wasn’t any, which was confirmed by the Semadang Kayak team). The last time I kayaked was months (probably years ago) and I hated it. This time around, though I was still not entire enthusiastic about kayaking, I totally enjoyed the breathtaking view that can be seen along the way. After one hour of paddling and babbling around (thank you dear partner from projektravel.com who tolerated my endless stories about life), we stopped for lunch by the river. The lunch menu was again alluring as we were served with Bidayuh (Sarawak tribe) traditional brown rice, caramelised chicken with brinjal and fish cooked in coconut gravy. After loading up food and boosting back lost energy, we paddled again. The remaining hours filled with splendid views and photographic the moments made us lost track of time. When we were only about a kilometre away to our finishing point, it rained and the water rose. We ended the day wet. Back in Kuching, as a reward for the wetness we had to endure, we were brought to places where we can shop (yes, as a Malaysian, shopping is therapeutic). I managed to get a basket filled with various flavours of kek lapis (layered cake) and a box of terubuk masin (salted fish) along with some cute fridge magnets as souvenirs. After a quick rest, the Tourism Selangor team brought us to Sarakraf for the closing ceremony of TS Day Out 2015. I came for the food, of course, and I feted on umai (salad and raw seafood mixed with vinegar and onions), oyster omelette (this time it was served with browned oyster), midin (stir-fried fern), fried chicken and seafood tomyam (clear sour soup with seafood in it). At the same time, the organisers showed the images of all participants and their antics while trying to answer the questions during the race in Klang. My partner and I didn’t win the race but I was glad to be announced as the winner of the Instagram contest. I want to visit Sarawak again for the Rainforest World Music Festival next August 2016! The night didn’t just end there as I took the advantage to meet my Sarawakian friend and it was a privilege to get a personal tour guide to hunt for the food I missed during the programme such as ayam raja penyet (quashed roasted chicken) and ais krim gula apong (brown sugared ice cream). I went back to the Imperial Hotel with a smile from ear to ear. I came down for breakfast early that morning and happened to find other friends staying at the same hotel who were there for work. We chatted before I left for the Fairy and Wind caves visit. The journey took us about one hour plus to reach Bau, Sarawak. As a nature lover, I looked forward to visiting the caves. The visit was memorable – we needed to climb up the stairs to finally reach the top. I love Fairy Cave as it reminds me of the caves I explored in Peninsular Malaysia. The lunch fixed for us was Indian style that day. We had naan and gravy, coloured rice, spiced chicken and fish. Since our flight home was at 6:00 p.m., we killed time by buying souvenirs and food (some even bought belacan). I must say that the entire TS Day Out 2015 experience was fun! I therefore extend my gratitude to Tourism Selangor for giving me the opportunity to discover Selangor and Sarawak in one trip. The programme was indeed an eye opener and best to know that some parts of Malaysia have beautiful gems that we Malaysians need to appreciate. Yes, Klang has a lot to offer but I haven’t got the chance to explore it yet.